Love them or despise them, some of the most played games are those that have the least rules and actions to memorize. When I discovered this release from Crystal Tower Games at Gen Con earlier this summer, I immediately thought of two activities, “Bingo” and “Yahtzee,” either played by the very young or close to ancient. Yet, once I sat down to try this out among family members, it felt like the best of those long ago times combined in a fresh experience. It works for any type of gamer because you don’t have to be a genius to win it, though don’t be surprised if you find yourself feeling the call for Vegas high stakes afterwards. “Six Shooter” may not be the most innovative title on the market, but it succeeds in keeping one’s attention till the final round. 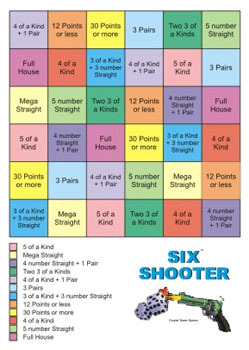 To play this suitless version of poker, you need only six dice for up to four players, a board of squares for each player marked with three squares each for 12 possible dice combinations, dry erase markers and a deck of 36 cards with those dice combinations. 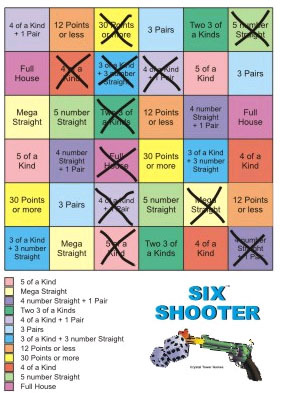 This all is included in the box where a random card is drawn each round and each player has up to four chances to match through dice rolls what is on the random card per round until a straight or diagonal row is filled. Though it is more fun to play with the full amount of people, the game is set up to work even if you need a personal activity to pass the time. It operates in such a way that it feels like four separate competitions going on with the win depending on who reaches the goal first. However, this game seems to be a bit too late to distract me from all those agonizing hours I spent trying to escape the horrors of high school math. Time should not be a problem either because you can easily fit even the most unlucky dice rolling experience within half an hour. Trust me on this, because though it felt like my group could never get enough squares crossed out for a win, the miracle did eventually occur. At $25.00, the price at first may seem a bit steep for something as stripped down as this title, but for something that is produced by an independent game company, it certainly could be a lot more expensive. In the end, it may not be the must have title of the holiday season, but with most of the crap that comes out every year, you could purchase much worse. 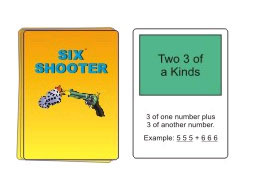 This earns the “Six Shooter” board game four and a half out of six gambles. Images are copyright of Crystal Tower Games. Past Entertainment: DVD reviews of Good and The Lovely Bones.